The Yukon Outfitters Walkabout Rainfly is an amazing bargain. The tarp doesn’t pretend to be anything it isn’t, and yet it surprises in both durability and light weight. If you’re looking for an inexpensive diamond tarp, whether for a new hammock camper or a rising pro hanger, this is a workhorse tarp. The Walkabout Rainfly from Yukon Outfitters is a basic, low frills, diamond tarp. 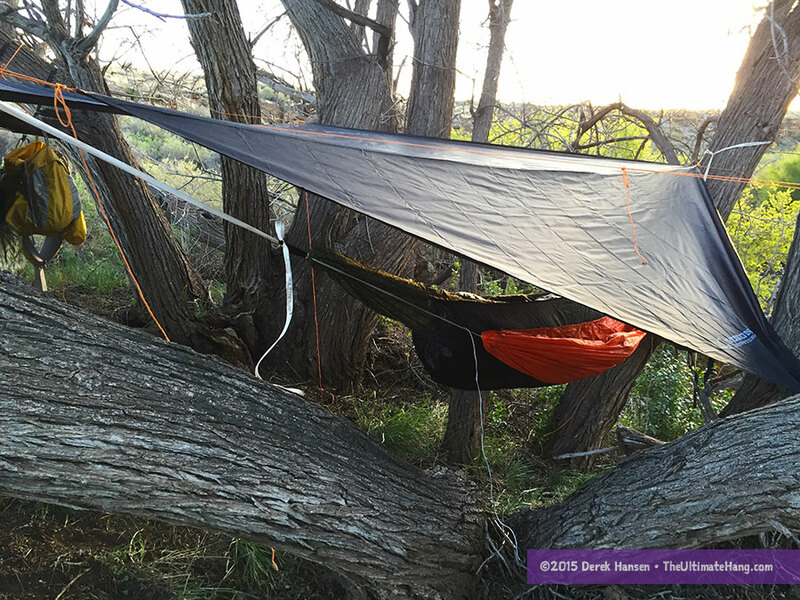 The diamond design pairs perfectly with hammocks and provides ample coverage in most conditions. The tarp comes with a stuff sack and two simple steel stakes. The reflective guy line completes the kit, making it ready to pitch upon receipt. The Walkabout Rainfly is another product from Yukon Outfitters that has surprised and surpassed my expectations. A lot of folks have snapped up the Walkabout on discount sites like Woot, thinking that the tarp would be a good “loaner” tarp for friends and family. While it certainly works as a “loaner” gear, I’ve been impressed enough with it to use it with my own family on our backpacking trips. The tarp has four guy points: two for the ridge line, and two for the side tie-outs. Small metal grommets are placed in reinforced triangles on each of these guy points. The extra reinforcement has held up perfectly in some very violent storms. My son uses the Walkabout for all his hammock camping. Here, at summer camp, the tarp provides great shade. The tarp packs down into a small cylinder, not much taller than a 1L Nalgene bottle. For the amount of coverage it provides, it’s weight is impressive. It really makes a great backpacking shelter. 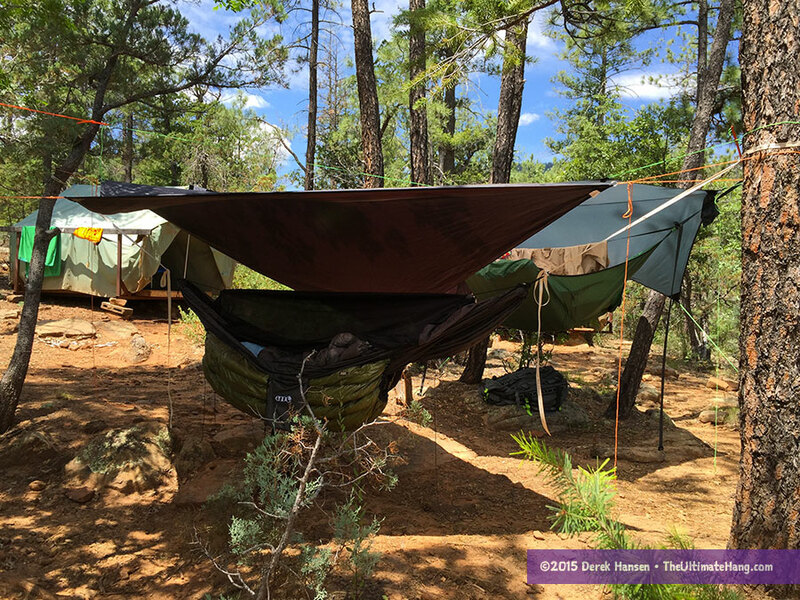 On one trip I took with my son, we fit both of our hammocks under the Walkabout, by using a close V formation. My son and I are both nestled under the Walkabout during a backpacking trip to Fossil Springs. The guy line is a value line, no question. It’s a little spongy with some stretch, but the fact that it is high-visibility and includes reflective tracers makes it hard for me to replace it. The line has held up well under extreme strain, so I’ve just left it attached. The only modification I’ve done is to tie different knots (a bowline) to the tarp. The line holds knots very well. The tarp sets up easily with just the two guy points and the ridge line. Replacing the line and using a continuous ridge line or other method is easy. When packing, I find that the tarp works best when folded and then rolled. It takes a few more minutes than just stuffing, but I can also get it to fit down into a small pack size and use the included stuff sack. I’m actually really happy with the build quality of this tarp. The owners of YO were slightly apologetic about the tarp, recognizing that it is a value tarp and not your typical high-end silicone-impregnated nylon. From their own description, I would have expected it to have worn out already, but it has been a workhorse. On a trip we made this summer to Lake Powell in southern Utah, I used this tarp for shade and rain protection on our multi-hammock stand on the beach. We experienced an unseasonable monsoon storm that brought violent wind storms for three nights. Some of my other tarps I had up were ripped apart, but the Walkabout held solid. In fact, there was no noticeable strain or issues of any kind. I was absolutely stunned. In the rain, the tarp has performed just fine, without any leaks or stretching issues. This is a tarp I recommend to new hangers, particularly youth groups. The tarp is easy to set up, thanks to the included guy lines and stakes, and only two guy points. This is the tarp my son uses when we go backpacking. 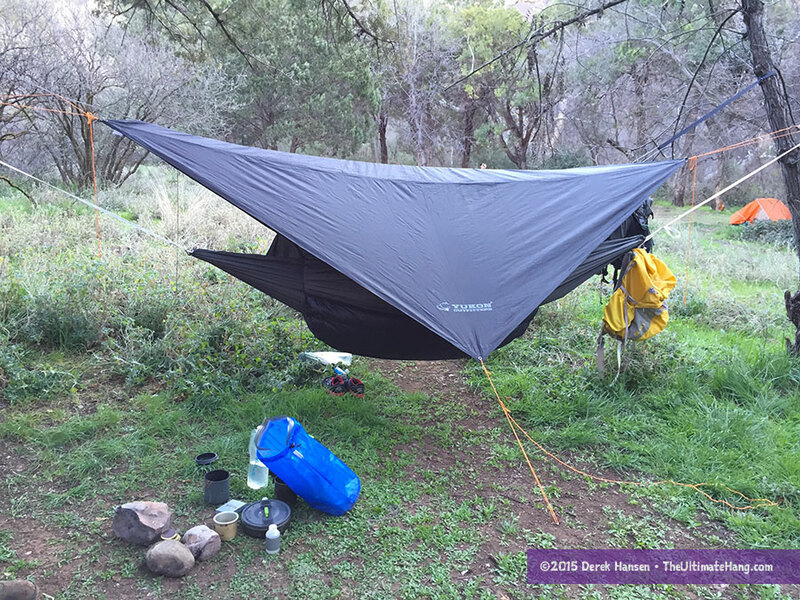 Still, I find that diamond tarps are extremely useful for everyday hammock camping, and I think even seasoned hangers will find some utility with the tarp, even if it is to have one or two on hand as loaners. This is a great little tarp. 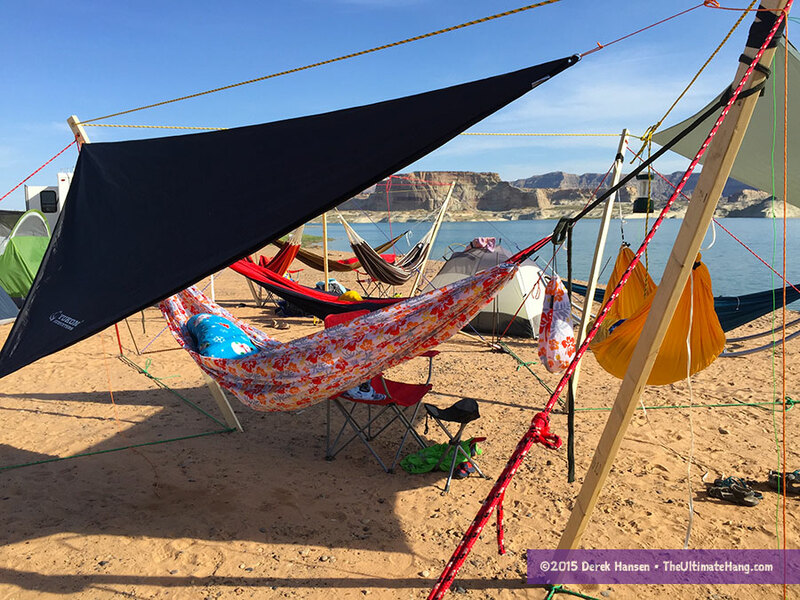 That Lake Powell picture is just fantastic – the earth-toned landscape provides a nice palette for the color of your DIY hammocks and the poly rope on your tensile stand. Good composition! If I may – I have a question about the tensile stand. I made one, and set it up in a nearly field. I experienced a problem where the steel rings kept sliding off the top of the rebar stakes, as it was drawn upwards by the strut. Is there a specific angle to put the rebar stakes in that is more successful (say 45°)? I think mine were about 60°, and I didn’t have the energy to remove/repound them. Yes, 45 to 60 degrees away from the struts. I just picked up some corkscrew stakes from Lowes: http://www.lowes.com/pd_263145-81227-ANCFRS8-ORG-L_0__, and am going to try them out this weekend. They’re rated at 125lb. I think they’ll be easier to place, certainly, and safer for the Camporees – Scouts never look where they’re walking (no news to you), and rebar would be especially invisible. Well, the Vortex stakes were a success – held all the weight I threw at them, with no complaints. These are my “go to” stakes now for the stand. Thanks for the suggestion of the stand – it’s a godsend in Nebraska!